Everyone loses hair everyday. On an average, we shed about 50 to 100 strands a day, but we do not really notice it since we have thousands of hair on our scalp. We lose hair when we brush, shampoo, condition, hair dye, heat style, or basically anything that we do to our hair. In fact, sometimes we just wake up with some hair strands on our pillow, right? But shedding hair is not really bothersome, it is a cycle that our hair goes through. They also grow back, which is why we also see a lot of baby hairs sticking out. But what if hair does not grow back? What if you noticed that your hair is thinning? Then, you must pay close attention to it. Hair loss can be demoralizing. It can be stressful. It can lower your confidence and can cause embarrassment and depression. What are the causes of hair loss anyway? Learn the details and how to treat these causes. Nutritional Deficiencies. Many women have very busy lives, which can leave little time to concentrate on eating well-rounded nutritious meals. However, the foods we eat supply vitamins which can prevent hair loss. When we lack these nutrients, hair loss and thinning can occur. This can be prevented by using a hair vitamin formulated with hair specific nutrients to nourish your hair from the INSIDE OUT and promote faster growing, longer, thicker, stronger, and more vibrant hair. Hereditary. One of the most common causes of hair loss in women is genetic, known as androgenetic alopecia. You can inherit it from either your mother side or father side, or both. Pregnancy. Most of the time, women experience hair loss after giving birth. For the new mothers, do not worry as it will grow back after a few months. Stress. Stress can be one of the major causes of hair loss in women. This could be from major surgery, severe illness, drastic weight loss, car accident, or extreme anxiety. If you have illness or have undergone surgery, just be patient and your hair will grow back. If you are experiencing extreme stress, the only way to stop hair loss is to relax. Watch a movie, spend time with your loved ones, eat in a good restaurant, exercise, or do whatever that will let you forget about stress. Medication. Hair loss in women can also be caused by the side effect of a medication you are taking. Some examples are vitamin A, birth control pills, non steroidal anti inflammatory, anti clotting drugs, weight loss drugs, beta-blockers, antidepressants, drugs to lower cholesterol, high blood pressure medications, and a lot more. Once you stop intake, hair will soon grow back. Make sure to ask your doctor first before making any changes to your medication. Anemia. This is caused by iron deficiency, which means there is not enough red blood cells in the blood. If you do not eat foods rich in iron or if you are having heavy monthly period, you may be prone to anemia. Symptoms of anemia include feeling weak and tired, headache, looking pale, and hair loss. But to diagnose this, you must get a blood test. If you are positive, eat foods that are rich in iron like pork, fish, beef, beans, and leafy vegetables, and also foods with vitamin C to enhance the absorption of iron. If not properly treated, anemia can be one of the causes of hair loss in women. Heat styling and hair chemicals. Too much use of heat styling tools, such as curling iron, blow dryer, and flat iron, as well as hair coloring, straightening, and perming are the most common causes of hair loss in women. Basically, anything that you do to your hair that could damage it can be the reason why you are losing too much hair. Usually though, hair loss from heat styling and hair chemicals is due to breakage, which means that the hair shaft has been broken. How would you know if it is due to breakage? Check the pieces of hair that fall if there are follicles or roots on one end. If none, then it means you are experiencing falling hair due to hair breakage. To address this, simply minimize the use of heat styling tools. If unavoidable on certain occasions, then use products to keep your hair healthy, like a heat protection spray prior to blow drying. Also, keep your hair strong by using conditioner and hair treatments. If your hair is damaged, use the Strengthening Amino Masque after each wash followed by the Balanced Moisture Conditioner. Scalp problem. Fungal infection, dandruff, and psoriasis can cause inflammation on the scalp, making it difficult for hair to grow. 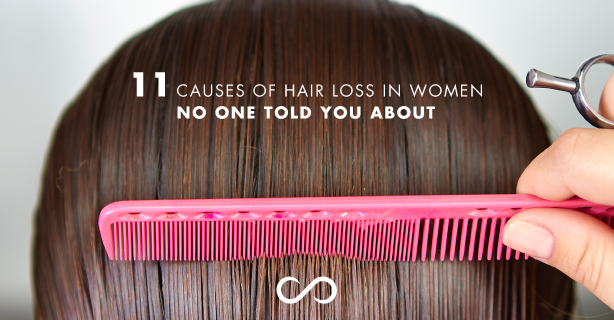 So, it is also one of the possible causes of hair loss in women. A trip to your dermatologist is a must to determine which condition you have. Prescription would vary depending on your condition. Alopecia areata. This disorder occurs when the immune system attacks the hair follicles. Alopecia areata usually causes smooth, round patches of hair loss on the scalp, legs, or eyebrows. Alopecia totalis, on the other hand, is complete baldness on the head. Hair loss all over the body is called alopecia universalis. To treat alopecia areata, doctors usually prescribe intralesional corticosteroids. Reducing anxiety or stress can also help. Hypothyroidism. Thyroid disease usually occurs on women. It happens when your thyroid gland is not producing enough thyroid hormone, which is important for metabolism. This can result to hair loss. To know if you have hypothyroidism, a blood test must be done. If positive, thyroid medication will be given by the doctor to normalize your thyroid levels. Once corrected, hair will grow back. Lupus. It is an autoimmune disease where the immune system becomes hyperactive and attacks healthy tissues. Aside from hair loss, symptoms of Lupus include joint pain, fatigue, headache, oral ulcers, chest pain, and anemia. See a doctor to properly address hair loss caused by this disease. If you can stop hair loss, then do it. You just have to first know the real causes of hair loss in women and apply the right treatment. If your hair loss is permanent, there are still number of ways to deal with it. You can try a different hairstyle to hide baldness. If hair is thinning, you can also get hair extensions to bring back the volume of your hair. Wig is also a good idea. There are a lot of quality wigs out there that look real. You can also experiment on hair accessories, like scarves, bandannas and wraps. Lastly, if you are ready to spend, then go for a transplant. Experiencing hair loss is not that easy, but your whole life should not be affected. There are a lot of ways to deal with hair loss, even if it is permanent. Hairfinity is transforming the hair of women all over the world with a unique blend of vitamins, nutrients, and our exclusive Capilsana™ Complex. Users of Hairfinity have reported improved manageability and overall appearance. Order Hairfinity Hair Vitamins today.